A decidedly local green has started poking through the mass of exotic mushrooms, Thai eggplants and other cultivated specialties at the Carmel Market -- shoots of mulukhiya, a Middle Eastern specialty somewhat strangely known as Jews' mallow. In some markets around Israel, especially those catering to a more mixed Arab-Jewish population, it's quite common -- at the Ramle market, you can get cultivated mulukhiya even when it's out of season, as fellow blogger Sarah told me -- but in Tel Aviv it's a good deal less common. Mulukhiya, also written mloukhieh, is the Arabic name, which is also used in Hebrew; some sources say the name comes from the similarly written Arabic root for "royal." It's a member of the jute family, corchorus, a word that means, somewhat less elegantly, "mucose." Uncooked mulukhiya has a smell that somewhat reminds me of asparagus; the cooked stew has gumbo-like properties that will please people who like okra in all its gooeyness. While obviously the number of ways to prepare mulukhiya varies along with the number of cultures (households? cooks?) who call the dish their own, but one traditional, fairly common means of preparation calls for plucking the leaves from the long, spindly stems and quickly boiling them into a viscous stew, flavored with fried garlic. This is the Egyptian method, and can also be found in Israel, as I confirmed with some of the friendly market sellers. I picked up a bunch from the stand behind the juice-seller on Yihyeh Street (parallel to the main Carmel strip), who also offered me a few fresh chickpeas and tiny sour plums to try. I picked up about 400 grams at 10 shekels a kilo, which isn't bad, although you only use the leaves, not the stems (which make up the bulk of the weight). Since then, I've noticed mulukhiya being sold at some of the greens stands inside the main Carmel strip, too. Since making my mulukhiya into a stew would have been too obvious, I decided to incorporate it into a filling for ravioli, mixed with sweet potatoes. After all, why not? As I've explained in earlier posts, I have a pasta maker, which makes the job much easier, but in theory you could make stuffed pasta by hand. 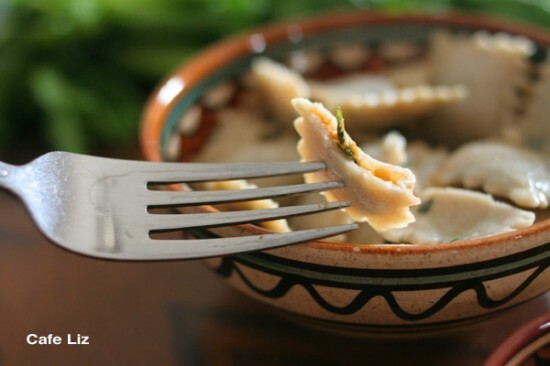 Also, this recipe easily converts between vegan, parve (non-vegan) and dairy, depending whether you want to use egg in the pasta, and cheese in the filling. I used both. For a richer pasta, you could also use up to 3 eggs, and not use water. Mix into a stiff dough. Knead for a few minutes until elastic, and then let sit for at least an hour. This makes it easier to work with. Roll out into thin sheets (I used setting #5 on my Atlas machine -- 1.6 mm, a.k.a. 1/16" ). Peel and chop the sweet potatoes; boil until soft in a big pot. Drain the potatoes; keep the boiling water and set both parts aside. 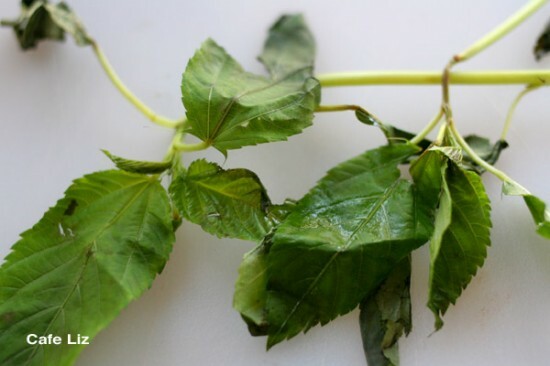 Remove the mulukhiya leaves from the stems, and chop the leaves. In the pot, heat the leaves with a bit of the sweet potato water (about equal volumes water and leaves), bring to a boil and shut the flame. Pour the green stew into a bowl. Crush the garlic. In the same pot, heat a tablespoon or two of olive oil and fry the garlic until golden. Pour into the bowl with the mulukhiya. Combine the mulukhiya (about 6 tablespoons worth) with the sweet potatoes, and mash together. Grate in the cheese. This is your ravioli filling. Fill the strips of pasta with the filling. I used the ravioli attachment on my pasta machine; you could also do this by hand. Pour the sweet potato cooking water back into the pot; bring to a boil and cook the ravioli for a minute or two, until the pasta is chewy. Toss with olive oil to serve. 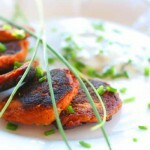 Read up on Sarah's blog and at Syrian Foodie. 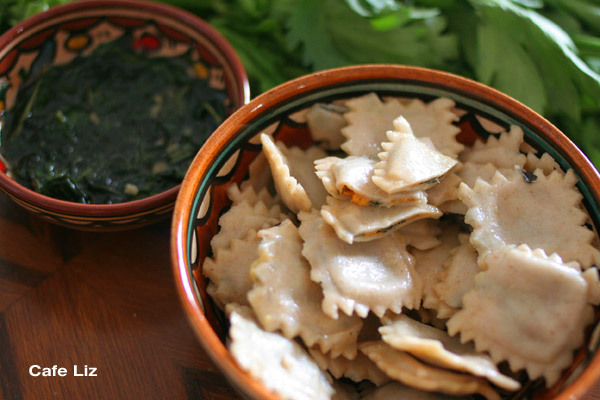 11 Responses to "Ravioli with mulukhiya and sweet potato"
Very interesting. I am going to have to try that sometime. 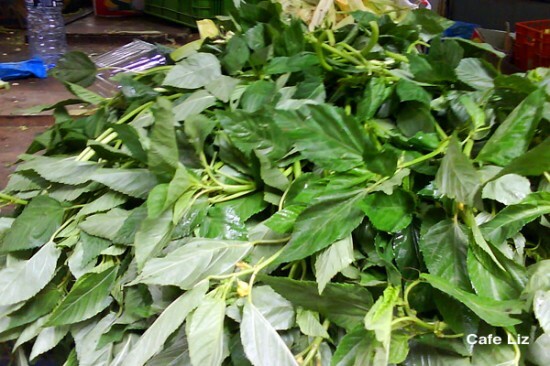 I have never tried mulukhiya,and nice to know that it can be found at the Carmel market too. 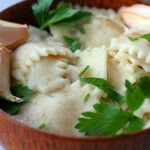 Your raviolis look lovely! I was just thinking about mloukhia yesterday (things like that just pop into my head), I thought of adding cheese to it and then perhaps I would not notice it’s famous slimy texture. 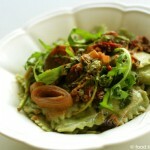 Your fusion cuisine looks delicious! Another verry interesting exotic ingredient that I have never heard of in Germany. Thank you for another interesting discovery from Israel. Sarah, if you do something with molokhiya and cheese, I think it’d be quite interesting, and I’d love to see a blog post about it. Thanks, A-Man! We have all sorts of weird things here. Hi Sally, yes, the mulukhiya is diluted enough by the other ingredients so that it’s no longer gooey. Sally, one other thing I just realized, regarding your question about the gooeyness — part of the reason my pasta didn’t have a gooey texture (I think) is because there was only a thin layer of filling in every piece. So, it’s possible that the lack of critical mass of moloukhiyeh leaves kept the filling from getting gooey inside. Thanks Liz. I must try it sometime.